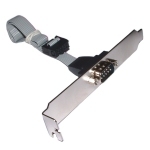 These internal serial cables are typically used to connect to a motherboard header and provide an external serial (COM:) port on the rear of a PC. A fitting bracket (as shown) is provided. If unsure, please check your motherboard manual for the COM header connection, and ensure that the function of each pin corresponds with the function of each (ribbon header) pin as per the diagram above. If they differ, please check our cross-wired version of this cable for suitability. Information concerning the function of the DB9 connector pins are given in the diagram above for completeness. Note: Cable length is 50 cms.